This map of PlayStation Network is only suitable for the Russian Accounts (Russian region). Maps PlayStation Network Cards - a great way to add funds to your wallet PlayStation Network. To do this, buy a card rather PlayStation Network Card and enter a 12-digit numeric code. After that you can easily download any materials from the PlayStation Store, using any platform with support for PSN: PlayStation 3, PSP, PSPgo. - Demo - version / videos of new games. - Additional content that enhances the gaming experience - add-ons, maps, themes, new missions, artifacts, etc. - Videos, comics, other multimedia content. - Dynamically expanding the main catalog of games for the PlayStation all publishers. - Exclusive Games PlayStation Network, including affordable games of MINIS directory. - Compatible with any platform that supports PSN: PS3, PSP, PSPgo. - Easy to use, information support in the PSN interface and website (general information, technical support, PSN news, announcements). - Availability gaming, multimedia content and services, offered only on the PlayStation Network server. 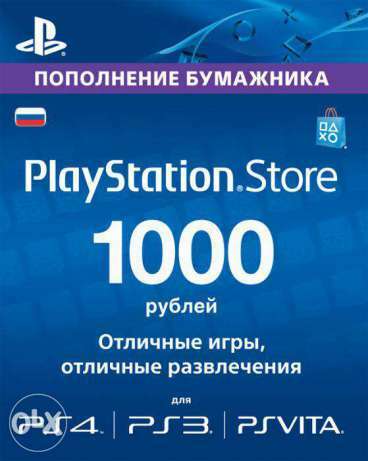 - Payment Card PlayStation Network - a very good and popular gift for all owners of the PlayStation. Всё отлично,код активировался ,жду подарка.